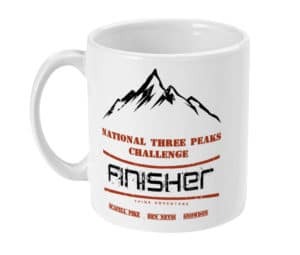 Welcome to the start of the National Three Peaks Challenge! Ben Nevis is often the selected peak to start the National Three Peaks Challenge. 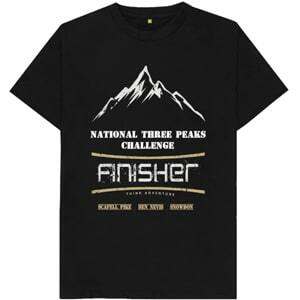 It is the largest peak to complete and tackling the hardest peak with fresh legs is recommended. Always check the weather conditions before attempting to climb Ben Nevis. It is often impassable for hikers due to snow. It is recommended to complete the challenge between June and September to reduce the likelihood of snow disrupting your challenge. Always be prepared to abandon your challenge. You can check the weather forecast for Ben Nevis using the Mountain Weather Information Centre. The route up Ben Nevis is signposted in areas but cannot be relied upon for your only means of navigation. On a clear day the route is plain to see, but poor visibility is common and it can be difficult to navigate. Always ensure you have a map and compass. The starting point is Ben Nevis Visitors Centre. If the Ben Nevis Visitors Centre is open, speak to a member of staff about the visibility, weather and route. They provide walkers with up-to-date information of Ben Nevis’s conditions at the summit. There are 80 car parking spaces for £4 all day parking. Minibuses are £10 all day. The car park is open 24 hours and is a pay-and-display car park. 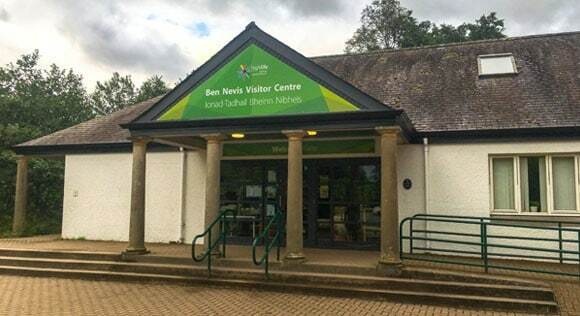 There are toilets at the Ben Nevis Visitor Centre which are open between 8.30am-7.00pm each day. The shop contains snacks, drinks, equipment and souvenirs. 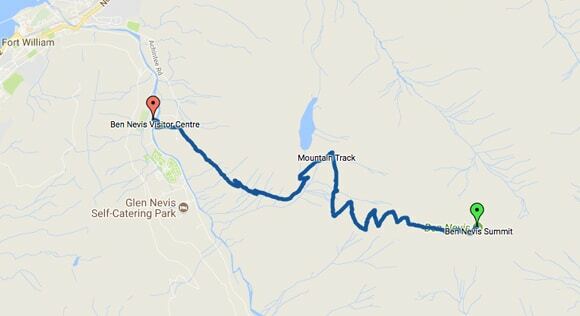 You can reach the Ben Nevis Visitor Centre on 01397 705922 or email glen.nevis@highland.gov.uk if you require further information. View route in Google Maps. 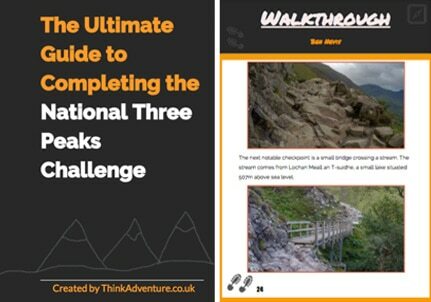 The route up Ben Nevis for the National Three Peaks Challenge is the Mountain Track. It is the best route for summiting Ben Nevis without climbing equipment or prior knowledge of climbing the mountain. The route used to be called the Tourist Track, but it was changed as the name “Tourist Track” made it sound too easy and walkers were selecting other routes and getting into difficulties. 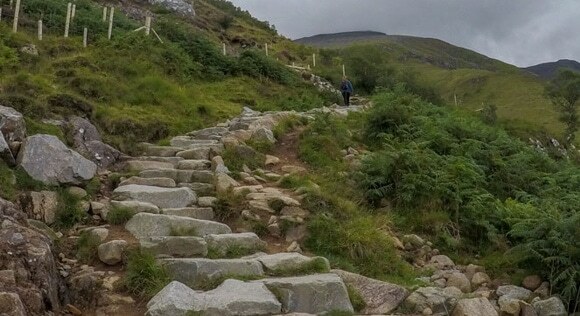 The Mountain Track route may be the easiest up Ben Nevis, but it is still a challenging ascent. Facing the Ben Nevis Visitor Centre, head left and cross the bridge over the River Nevis. Once you have crossed the bridge, turn right. Follow the path, with the River Nevis on your right-hand side. 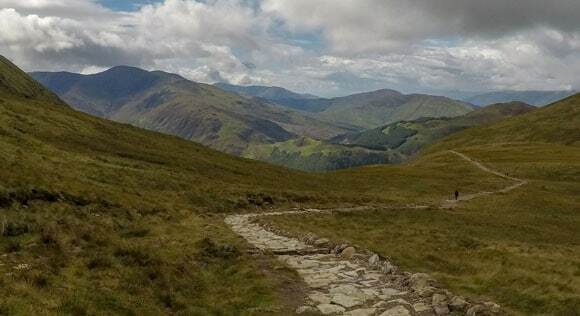 After a short walk you will reach a three-way signpost for the Visitor Centre, Youth Hostel and Ben Nevis. Take a left turn following the sign for Ben Nevis. 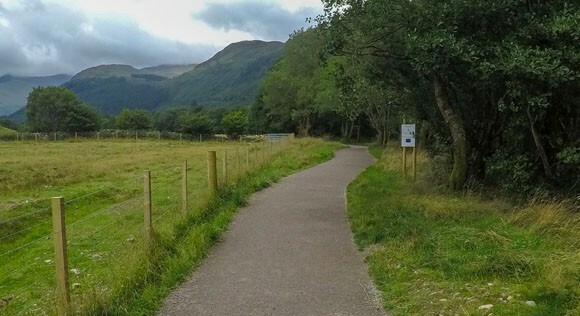 There’s a small fence you need to climb over, but it’s a small and clear path leading to the next three-way signpost for Achintee, Ben Nevis and Visitor Centre. Take a right, following the signpost for Ben Nevis. The start of the Mountain Track is pleasant; the terrain and gradual gradient are friendly. The next point of interest is where the Youth Hostel Route meets the Mountain Track. The Youth Hostel Route meets the Mountain Route at a steep angle so it is difficult to accidentally go the wrong way. There’s also a signpost, but if you are in any doubt, keep going straight. The terrain is harder after the Youth Hostel path. The gradual incline is accompanied with steps and small rocky sections that require little bits of scrambling. The next notable checkpoint is a small bridge crossing a stream. The stream comes from Lochan Meall an T-suidhe, a small lake situated 507m above sea level. The path from this point is a mixture of rocks, steps and gradual paths. Along this section you’ll notice a stream to your right and a lake (Lochan Meall an T-suidhe) to your left. There is an important right turn along this path. Use the lake as a checkpoint ready for the right turn. The Red Burn is a prominent checkpoint. This is a good opportunity to check your current time and determine if you are on target for your ascent time. You have to cross a small stream. It is usually shallow over the rocks and simple to cross. With a good pair of hiking shoes your feet will barely get wet. After a lot rainfall this stream can be deeper with a stronger current. Do not cross the stream if it is unsafe to do so. The below photograph is the Red Burn in April. 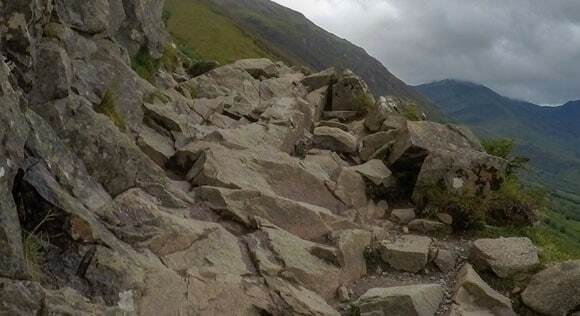 It’s not always a clear path to the summit of Ben Nevis. For the majority of the year it’s not possible to walk to the top without climbing equipment. 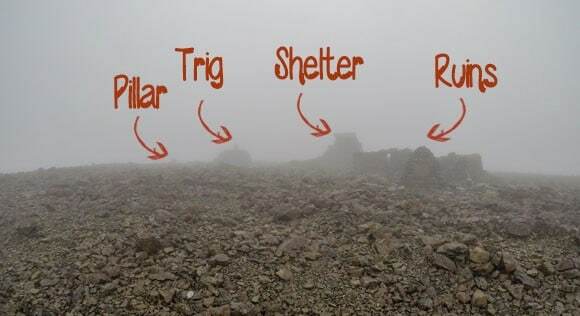 Always check the weather at the Ben Nevis Visitor Centre before setting off. The Red Burn in April. The Mountain Track was unsuitable for hikers. The route from the Red Burn is easy to follow in the summer months i.e., without snow. You will follow a zigzag up the track on a clear path. Don’t take shortcuts here as it damages the area and slippages may cause injury. Depending on your luck and the British weather, you may be in the clouds with limited visibility. Apparently there are only 14 days a year where Ben Nevis is clear on the summit. The photos in this guide were taken in the middle of August. so chances are you’ll be subject to limited visibility, cold winds, rain and possible snow. After the zigzags you’ll reach the cairns. Winter walkers use the cairns to take bearings and map readings when the path is covered by snow. The cairns are useful for the summer walkers too: they help guide the way in poor visibility. There are a lot of cairns along the way. Keep following them and they will keep you on the right path. There are two gullies along the Mountain Track. They are near the summit of Ben Nevis. Keep following the path past the first gully (Tower Gully). 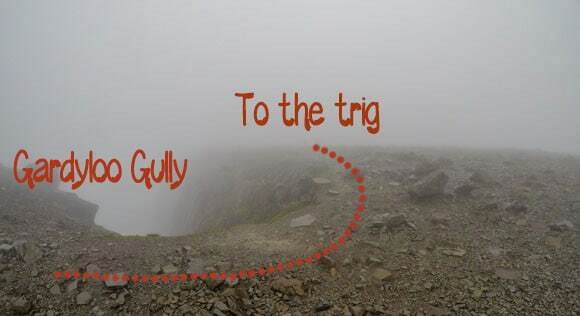 When you reach the second gulley, keep close to the left-hand side to find the trig in low visibility. Give yourself a couple of metres from the edge to ensure no slips or falls occur. 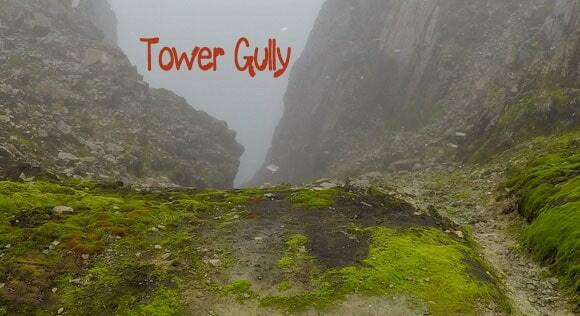 Depending on the visibility, you will see the trig, shelter or observatory ruins after 1-2 minutes of walking along the edge of Gardyloo Gully. The trig is elevated on a platform, which makes it easier to see from a distance. 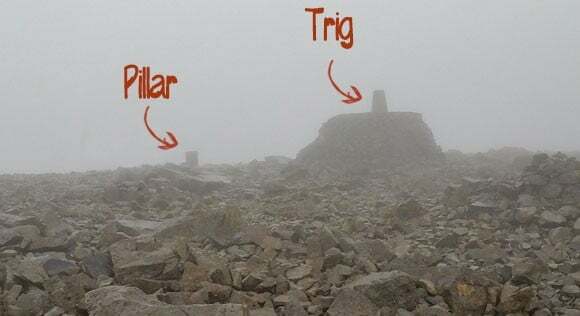 Touch the trig and enjoy the highest point in the UK! Descending Ben Nevis is relatively straight forward; you go back the way you came. If you lose your bearings on the summit, head from the trig to the stone pillar and head left along the edge of the gully. You’ll soon reach the prominent path. For really low visibility, ensure you know how to take a bearing with your map and compass. Going between June-September will severely reduce your risk of extreme weather conditions. 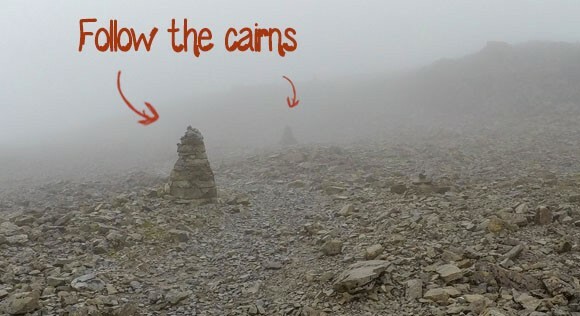 The same cairns that guided you to the peak of Ben Nevis will assist you on the way down. The added benefit of coming down Ben Nevis is admiring the views in the background. 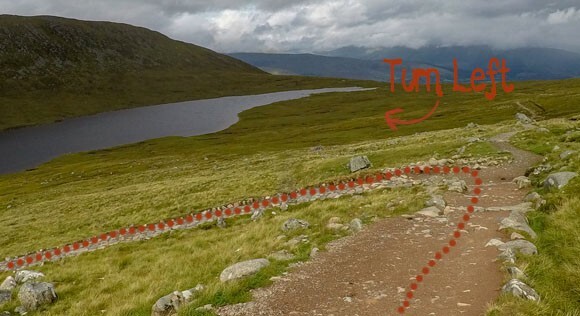 Use the Red Burn (stream crossing) to identify your halfway point and check your walking time. Shortly after the Red Burn you need to take a left turn. On a clear day you will see the lake in the background. The next checkpoint is the Youth Hostel track and signpost. Keep following the path straight ahead. You’ll finally reach the last signpost, which identifies the Visitor Centre. Follow the path and take a right at the bottom, putting the river on your left-hand side. Keep following the path and cross the first bridge behind the Visitor Centre. Congratulations, you’ve just climbed the highest mountain in the UK!